1873: Thurston’s new constitution: “Even old beachcombers saw the 1870s as the white mans’ age…. “Even old beachcombers saw the 1870s as the white mans’ age…. in the days of Cakobau’s kingdom – from 1871 to 1875 – Levuka was the major European social and polical hub, as race-war loomed. Ma’afu signed arms contract: The watchful Royal Navy dwarfed the cutters and schooners, and white residents who stood appalled …. in 1873, at the prospect of Fijian control under Chief Secretary Thurston’s new constitution, (and ) discovered that their suppose(d) ally, the Viceroy ‘Enele Ma’aful’atuitonga” had profound limitations as man of action. 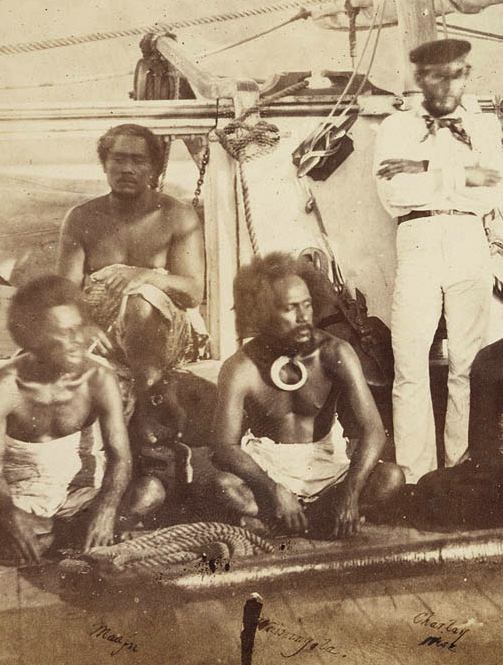 … Just before, Ma’afu signed the arms contract ( … and?… ) had sailed into port to announce his defection about his yacht Xariffa , sometime the property of the absconding Sydney business man, S.C Burt, Cakaobau’s business agent in matters like hiring out labour and member of his first cabinet”. Heneli Ma’afu was son of Josiah Tupo’u, the previous Kanokupulo. It is often suggested that George Tupou, King of Tonga sent Ma’afu to Fiji to make a kingdom for himself in in 1947 because he was a potential rival whose high birth and cleverness could make him a leader for the Kings energies. However there is no evidence that Tuopu did send Ma’afu to Fiji. Ma’afu played no particularly prominent role in Fiji until 1853, when Tupou – at the request of missionaries – appointed Ma’afu and (Sefania Lualua) jointly to govern the unruly Tongans in Fiji. Consul Pritchard favoured Cakobau over Maafu, because of the brutality of the Maafu-lead Tongan Methodist Wesleyans. Cakobau (Thakombau) in his time, was as brutal, but by the time Pritchard arrived at Levuka, Cakobau had begun to modify his traditional behaviour; he had a decade of engagements with missionaries and traders, notably, beche de mer trader, Mary Wallis. Pritchard shocked at Maafu ‘s warfare: The newly -arrived Pritchard – from the relative peace of Tahiti – reported – in shock – one example of Maafu-style Tongan warfare, this way : ‘Two wily.crafty chieftains were met face to face, each suspicious of the other, and both attempting to overreach one another. The result of their interview was that Thakombau sent a canoe, under the command of a trusty chieftain, to accompany Maafu’s expedition. A watch over Maafu: Thakombau’s real object in sending this canoe was to have a watch over Maafu, knowing as he did that he really could not check Maafu’s plans without an open rupture, for which he was not prepared. Maafu’s object was to shelter himself under the countenance of Thakombau, until it suited his purpose to turn upon his associate. Both chieftains conceived that they had each attained their respective aims, and overreached the other. Maafu and his followers arrived at Bua: In due course Maafu and his followers arrived at Bua, the head-quarters of Tui Bua’s district. Thence the united forces proceeded up the Mathuata coast, carrying all before them, and sending death and devastation into every Fijian hut. Tongans a fiercesome lot: In missionary reports we read fearful stories of Fijian atrocities and treachery, while not a line is penned to record the butcheries of the favoured Tongans, whose boast it is that they are the champions of Wesleyanism in Fiji. Fiijians surrender: The Fijians, to the number of about thirty, accepted the invitation, and on Sunday morning they emerged from their hiding-places, and appeared in the church. They gave up their arms, which were placed in the centre of the building. Tongans kill Fijians as they are ‘heathens”: Surrounded by armed Tongans, Semisi addressed them : ” You are all heathens ; you are all wicked men. You have fought against us who are propagating the religion of Tonga. You must all die.”* This speech concluded, Mafi, a Tongan, stepped from the side of Semisi, in obedience to a wave of his hand, and began tying one man’s right hand to the next one’s left, until he had completed the circle. Unarmed and entrapped, resistance was useless, remonstrance worse than useless. And with that stoicism which not unfrequently marks the conduct of the savage when inevitable death, however horrible the manner, stares them in the face, the Fijians passively submitted to their fate. Eyes gouged out; heads chopped off: Their hands tied, Mafi, in their presence and under the direction of Semisi, sharpened an American axe on a grindstone that was kept in readiness for the occasion. He then took up a bayonet that was fixed to a spear, and outdoing Nahash the Ammonite, deliberately gouged an eye out of each man’s head ! This done, he resumed his axe, and as the victims sat, tied hand to hand, and powerless, in the house of God, he chopped off each (head)’. Pritchard, William T. 1866 Polynesian Reminiscences; or, Life in the South Pacific Islands. London: Chapman and Hall. ‘Towards the end of the 1790s a new influence came to Tonga in the form of permanent European residents. The first of these were convicts who had escaped from the British Colony of NSW, which had been established on the east coast of Australia by the British government primarily as a punishment for criminals. In 1795, some of these found a place on on the American ship Otter, which put them ashore on Tonga. First white men to live in Tonga, a novelty: The names of these men were Morgan, Ambler and Connolly. As the first white men to live in Tonga, there were a novelty, and the chiefs were eager to patronise them. They were claimed by Tuku’aho*, who although he was not Tui’Kanokupulo, was the most powerful chief in Tonga. Usefulness of foreigners: Foreigners had often lived with powerful chiefs, but in past they has almost always been Samoans or Fijians, and were useful because they did not have obligations – except to the chief who adopted them. European residents became quite highly valued by the chiefs in the same way and some of them became quite important’.